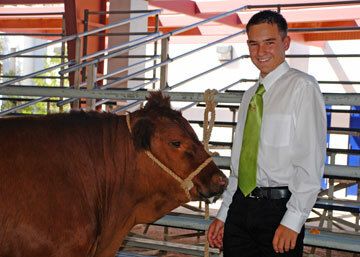 Q: Who is Eligible to participate in the county and state fair livestock shows? A: All youth participating in these livestock shows must complete a Quality Assurance and Food Safety Workshop to be certified. A: “Certified” means participating in a training with the Eight Good Production Practices covered and both the Rules are Black and White and the Quality Assurance videos are viewed. The total teaching time of the training must be a minimum of three hours. Q: How long does certification last? A: Three years from the date of certification. Q: What species require certification? A: Beef, Dairy, Goats, Sheep, and Swine. Q: How can I check my certification status? A: This website contains a database of all person certified; see the Participants List above. Q: Can I participate in a workshop in another county and be certified? A: Yes, this is a state level certification. Q: How will State Fair staff know if I am properly certified. A: You will need to provide your certification number on your entry form or you will need to provide a copy of your certification form along with your entry form. Check with each fairs requirements. Q: How can I find out when workshops are being offered? A: Check out the calendar of workshops or contact your local county extension 4-H agent or local FFA Advisor.